Say goodbye to the staircase behind existing lifts! They will soon be enclosed by acoustic barriers and demolished. Our Library building refurbishment has now progressed to preparing to demolish the stairs behind the lifts, with actual demolition planned for January 2019. You may experience construction noise, despite the acoustic partitions that are being put in place to help reduce the volume. Here is our advice on how you can still get to upper Library floors; find books moved during this work; and find alternative, quieter study space. How do I get to upper floors? 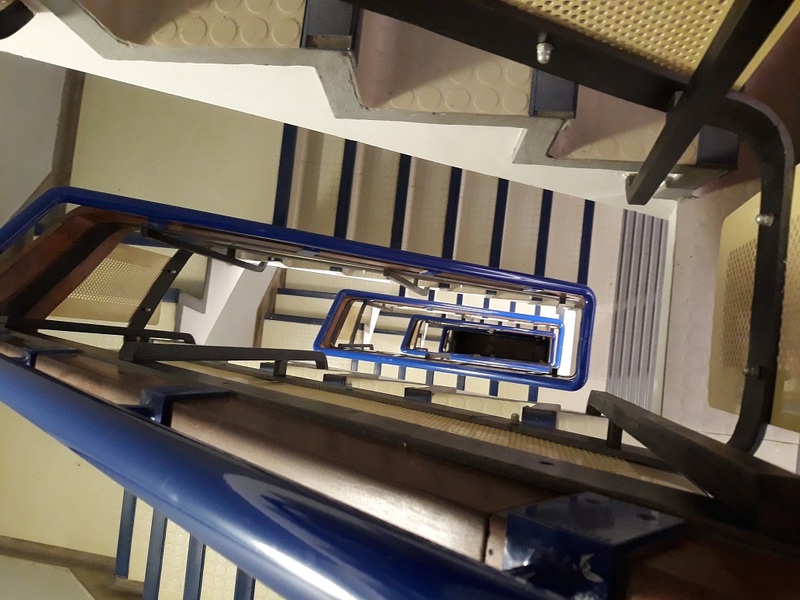 Although we will no longer be able to use the stairs behind our existing lifts, access will be maintained to at least two of lifts themselves until new lifts are ready. The big central staircase leading up from the main hall remains our main stairs, with other stairs around the edges of the building available for emergency evacuation. During hoarding construction, books previously shelved right next to the lift area have been moved elsewhere on the same floor. Please ask staff at the floor Information Desks if you need help finding them. On the 2nd Floor 337-338.52 has moved to the far (eastern/Eat at the Square) end of the room by the windows. On the 3rd Floor 728-733.5154 has moved to new shelves by the Information Desk. Where can I find quieter study space? This phase of construction will sometimes involve noisy or disruptive works. Please make use of the quiet and silent study space in the Library@URS building next door, as well as the variety of alternative study space options across campus. For more see ‘The latest on student study space’ (Student Services news, 31 October 2018) or Transform 2026: Study space update (UoR staff portal news, 31 October 2018). Demolishing this staircase will create space for print hubs on every floor and a silent study PC area on the 5th Floor. Find out more about the project on our Library refurbishment webpage. This entry was posted in General news, Refurbishment, Study Space. Bookmark the permalink.